1879-1880s autograph album of Ida May Stephenson of High Forest, Minnesota, and Rochester, Minnesota. On one page Ida spelled her surname Stepheson, but on two others, she spelled it Stephenson. On the page after the title page; gives her address as High Forest, Minnesota. 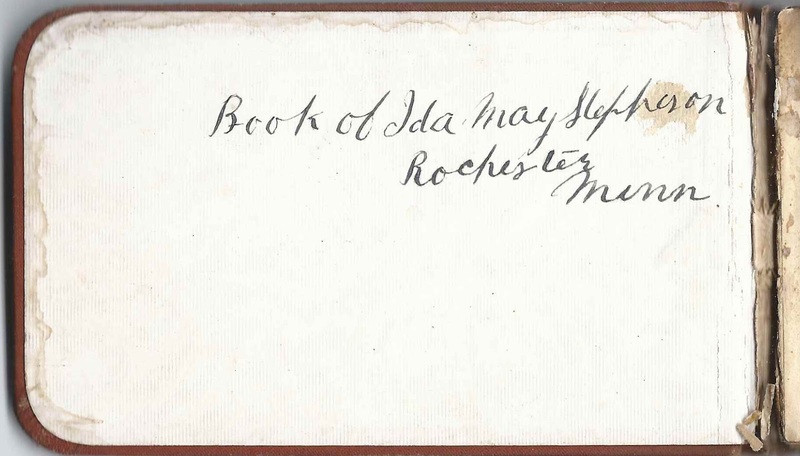 On the age that Ida inscribed to her future well wishers, she gave her address as Rochester, Minnesota. 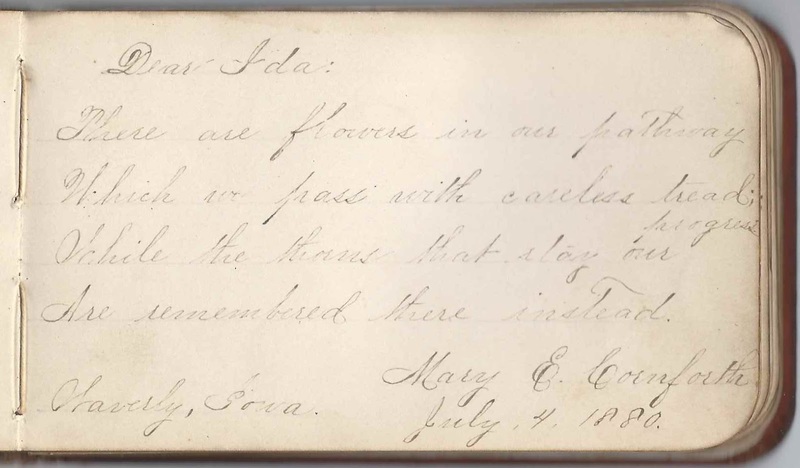 The album is approximately 5-1/4" x 3" and contains the sentiments of over 40 of Ida's friends, some of whom were possibly relatives. An alphabetical list of the signers appears at the end of this post. Ida May Stephenson was born 9 May 1861 at Rochester, Minnesota. I don't have the names of her parents, but according to information on the 1900 Census, her father was born in Ohio, and her mother in Wisconsin, though that information is sometimes incorrect, depending on whom the enumerator asked. 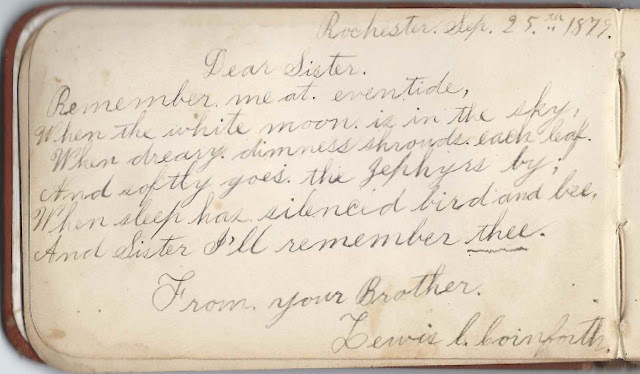 One signer, Lewis C. Cornforth, called Ida "Dear Sister", but I don't know if Ida was a sister, a half sister, a step sister, a foster sister or a contemporary to whom Lewis felt especially close. Lewis' parents were Charles and Mary Ann (possibly March) Cornforth, who were born in Maine and New York respectively. Charles was quite a bit older than Mary Ann, so I wondered if he had been married before. On the 1900 Census, they indicated they'd been married 39 years. Was Ida the child of Mary Ann from a previous marriage? Was Ida taken in by the Charles and Mary Ann at some point? I found some tempting possibilities, including variants of the name Stephenson, but would rather wait for a reader to clear up the confusion. 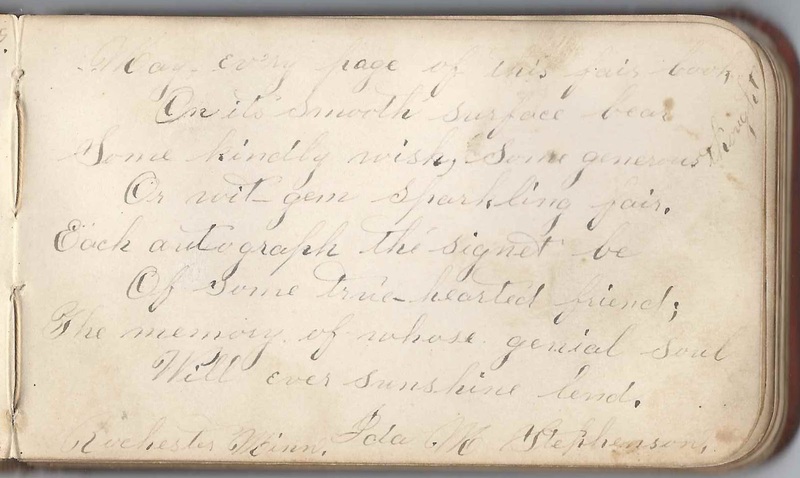 Charles' cousin Mary E. Cornforth of Waverly, Iowa, signed a page on July 4, 1880. Lewis' father Charles Cornforth and Mary's father William Cornforth were born at Industry, Maine, the sons of William and Lydia (Cates) Cornforth. On 12 May 1883 at Dodge, Minnesota, Ida May Stephenson married Victor Hugo Dyer, son of McNaughton and Louisa (Raymond) Dyer. Victor was born about August 1850 in New York. The couple lived in Nebraska, Illinois and Missouri. They raised, I think, two children, Fay L. Dyer, who died at about age nine, and McLaughton Maximilian Dyer. Ida died on 6 February 1929, and Victor on 22 May 1938. They're buried at the Wyuka Cemetery at Lincoln, Nebraska. Lillie "Never forget the Silver Polish"
Rover ? "The Sweetest life that Ever was led, Is Always to court and never to Wed."
Chester Andrus = 92 Born Otsego, New York. 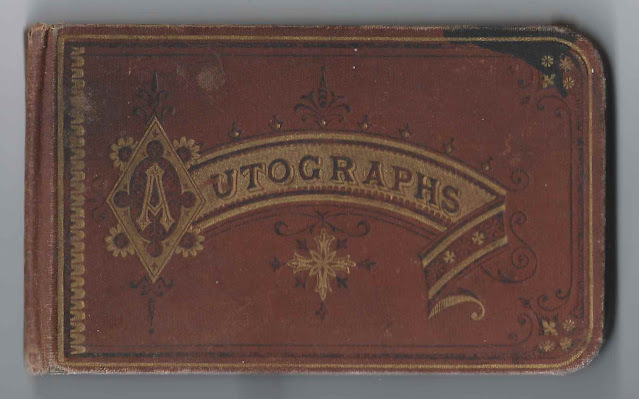 Signed at Rochester, Minnesota, in September 1881. He was born 24 September 1792 and died 26 February 1883 at Marion, Minnesota. He married Rachel Conant. Lewis C. Cornforth, signed at Rochester, Minnesota, on September 25, 1879. Inscribed the page to "Dear Sister"
Mary E. Cornforth, signed at Waverly, Iowa, on July 4, 1880. She was Mary Eda Cornforth, daughter of William Cornforth, a brother to Charles Cornforth, father of signer Lewis C. Cornforth. Mary would marry Erwin Lincoln Kingsley. George E. Meader, signed on "4/9/82"
H. S. Prince, signed on April 28, 1882. Not positive of surname; could be Prime or ? E. E. Race, signed at Dodge Centre, Minnesota, on January 7, 1883; presumably Eva E. Race, whose brother, Milton A. Race, signed the right facing page. Their older brother William H. Race also signed a page. M. A. Race of Dodge Centre, Minnesota, signed on January 7, 1883; presumably Milton A. 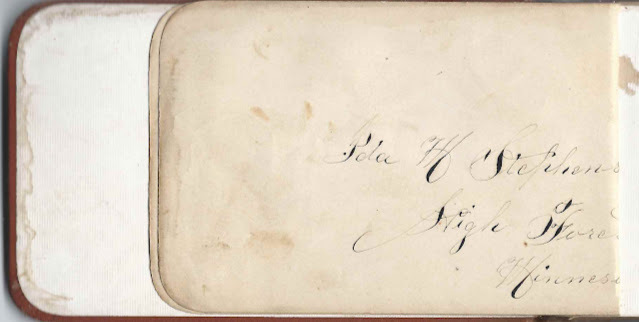 Race, whose sister Eva E. Race signed the left facing page. Their older brother William H. Race also signed a page. William H. Race at Dodge Center, Minnesota, on January 3, 1882. He was the older brother of signers Milton A. Race and Eva E. Race. William wrote his page so that the reader must use a mirror to decode it. Mate L. Robinson of Dodge Center, Minnesota. "Don't forget the trip to Hasioga - Concord - Mantorville - and Kasson - and how cold you got. But never confess that you were cold - Hardly Ever." ..."I was not to blame for this being scorched - I am willing to be forgiven." Mate signed another page as well. 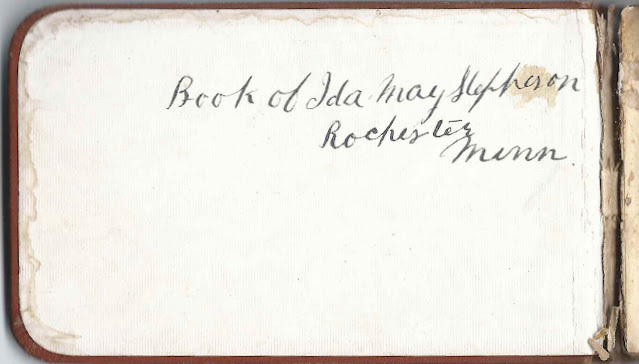 Inside front cover: "Book of Ida May Stepheson of Rochester, Minnesota". Most records have her name as Stephenson, and she herself spelled it Stephenson on two other pages. On one of the other pages, she gave her address as High Forest, Minnesota.